[182 Pages] Synthetic Rope Market size is projected to reach USD 1.69 Billion by 2021. The market is projected to witness a CAGR of 5.9%, in terms of value, during the forecast period. In this study, 2015 is considered as the base year for estimating the market size of synthetic ropes. The market size is projected for the period between 2016 and 2021. 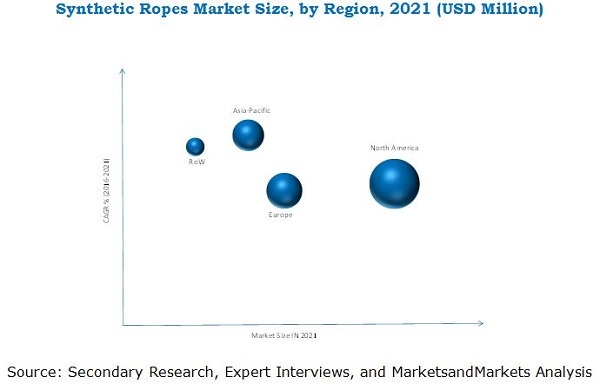 The report presents the size and the potential growth of the synthetic ropes market across different market segments categorized on the basis of material type, application, and region. In this report, the market sizes have been derived through various research methodologies. In the secondary research process, different sources have been referred to identify and collect information for this study. These secondary sources include annual reports, press releases, and investor presentations of companies, white papers, certified publications, and articles from recognized authors. In the primary research process, sources from both supply and demand sides have been interviewed to obtain qualitative and quantitative information for this report. The bottom-up approach has been used to estimate market size, in terms of value and volume. The top-down approach has been implemented to validate the market size, in terms of value. With the data triangulation procedure and validation of data through primaries, the exact values of the overall parent market size and individual market sizes have been determined and confirmed in this study. The figure below illustrates the breakdown of the profiles of primary interview participants. The synthetic rope market includes raw material suppliers, manufacturers, and end users. Raw material suppliers are Royal DSM (Netherlands), Teijin Aramid (Netherlands), Honeywell International Inc. (U.S.), and many others. The manufacturers include various companies such as Samson Rope Technologies (U.S.), WireCo World Group (U.S.), Cortland Limited (U.S.), Bridon International Limited (U.K.), Marlow Ropes (U.K.), and others. The end users include industries such as marine & fishing, oil & gas, construction, cranes, and many others. Each region is further segmented by key countries. The global synthetic rope market is projected to witness a CAGR of 5.9% from 2016 to reach a market size of USD 1.69 Billion by 2021. The market is highly driven by the low weight and high strength characteristics of synthetic ropes. Another key factor that is expected to drive this market is the safety aspect of synthetic ropes. Synthetic ropes are relatively safer to use compared with steel wire rope that are widely used by the marine, mining, and oil & gas industries. Nylon and specialty fibers such as high-molecular polyethylene (HMPE) and aramid are expected to register high CAGRs between 2016 and 2021, in terms of volume. Polypropylene (PP) ropes accounted for the highest market share as these ropes are widely used in the marine & fishing industry, sometimes in combination with polyester. Specialty fibers account for a small share because of their high costs; however, they are expected to garner high demand because of their exceptional high strength properties. The marine & fishing industry is projected to account for the highest market share during the forecast period. Synthetic ropes are widely used in the marine sector for mooring, lifting, towing, and other applications. Moreover, synthetic ropes have a huge scope to become a better alternative to the steel wire ropes used in the marine industry. The Synthetic ropes used in the cranes segment are projected to witness the highest CAGR during the forecast period. North America accounted for the largest share of the global synthetic rope market and is projected to continue dominating the market during the forecast period. Asia-Pacific is projected to witness the highest CAGR during the forecast period. The region’s booming fishing or aquaculture industry is expected to trigger the demand for synthetic ropes during the forecast period. Moreover, construction, cranes, and mining industries of the region are likely to provide growth opportunities to the market. High raw materials cost for manufacturing synthetic ropes compared with that for steel wire rope is the only restraint in the market. However, advantages related to the total cost of ownership of synthetic rope products and increasing awareness of the product among end-use industries are expected to overcome this restraint during the forecast period. The market players adopted both organic and inorganic growth strategies from 2011 to 2016 to strengthen their market position. Capacity expansions and new product developments are the major organic growth strategies adopted by the market players to enhance their regional footprint and meet the growing demand of synthetic ropes in emerging economies. WireCo World Group (U.S.), Samson Rope Technologies (U.S.), and Cortland Limited (U.S.) are some of the prominent players in the market. 11.4 Samson Rope Technologies, Inc.